No one could say they'd seen it before. That’s what was so genuinely exhilarating about those first weeks of protests in Madison against Wisconsin Governor Scott Walker’s effort to take away public workers’ right to collectively bargain. People had seen protest, confrontation, and direct action before, but now these were taking shape and combining in ways no one had ever expected. Rallies wouldn’t let up—protestors wouldn’t go home and more returned every day. An open-ended, intense confrontation between the people and the government grew day by day in the State Capitol. On February 17, students, graduate employees, and school teachers conducted an intense sit-in blocking the Senate chamber. The escalation of protest into sit-in provided cover for the flight of 14 Democratic Senators to Illinois to deny Republicans a quorum. Their actions stalled Walker’s anti-union legislation and brought national attention to Wisconsin’s worker movement. Without the sit-ins, the rising numbers at each rally, and the occupation of the Capitol, the Democrats would never have pulled off their escape or sustained their self-imposed exile. A clear victory emerged out of this new and exciting situation: the use of direct action to confront a state government. Approved by the legislature in March, Governor Walker’s “budget repair bill” (now called Act 10) was the centerpiece of the attack on public employee unions. It imposes on them increased health care and pension costs, requires unions to win yearly recertification elections, strips unions of membership dues deduction, and restricts wage increases to the Consumer Price Index. Looking back over the period since Walker introduced this legislation, we have seen the array of tactics used by the opposition movement change. Protest actions shifted away from the State Capitol when a Madison judge issued a temporary restraining order on the “budget repair bill.” With the bill stalled in court, the major labor organizations— American Federation of Teachers (AFT)-Wisconsin, the Service Employees International Union (SEIU), the American Federation of State, County, and Municipal Employees (AFSCME), and the Wisconsin Education Association Council (WEAC)— along with the Democratic Party, moved efforts back to their membership bases for a more familiar but, ultimately, more conservative electoral strategy. By April most of the mobilization of people created by the rallies in Madison had been diverted into local electoral and recall efforts. Observers watching this period in Wisconsin have compared the expressions of dissent to the social unrest of the 1930s or 1960s. But the concepts needed to grasp what is happening here, in all its complexity and oscillation, emerge from critically understanding the trajectory of Wisconsin’s Left movements and their links to the state’s unique histories of resistance. The breadth of resistance to Walker’s agenda is due to the fact that Wisconsinites responded to the attacks on workers’ rights as attacks on everyone’s rights. Walker is widely seen as violating the state’s progressive traditions of open government, workers rights, environmental protection, and strong public services. Earlier populist movements established many of these expectations, creating a unique state identity from the progressive victories of farmer and labor organizing, Sewer Socialism, and pro-worker legislation enacted by Republican governors. These traditions, combined with the recent legacies of civil rights activism, immigrant rights organizing, university unionization, and anti-sweatshop activism, have helped produce a Left political culture willing to resist neoliberal “reforms.” This may explain why it has taken until 2011 and the exploitation of the economic crisis for the Right to launch a frontal assault on unions and the public sphere in Wisconsin. Drawing on a local culture of political satire and a progressive identity, people latched onto the confrontation with Walker, expanding the fight beyond the members of public employee unions and making the struggle their own. Understanding the widespread attraction of direct action—rather than simply protesting, lobbying, or voting—requires a definition of radicalism not as strident rhetoric but as the capability for local cultures and confrontational tactics to interact in ways that advance a class consciousness. When direct action transformed the state Capitol into an occupation, people responded positively, joining the action in Madison or conducting local workplace disruptions of their own. High schoolers and college students across the state staged walk-outs, often multiple times. Teachers conducted sickouts, including the Madison teachers union’s three-day sick-out during the first week of protests. Several Milwaukee neighborhoods held forums on the impact of the budget that became springboards for community resistance. 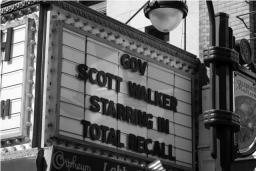 Walker’s corporate donors became targets for guerrilla theater and boycotts. Every action widened community support and served as a creative forum for dissent, as evidenced by the off-beat humor of homemade posters mocking corporate control over the state. So many people had made the movement their own that by March 12 an estimated 150,000 people gathered in Madison. Giving traction to popular dis-content, direct action gave local political and cultural traditions a route towards a new class consciousness. This was best expressed in the discussions of a general strike. By early March many workers, who may have never heard the term before, were actually imagining a general strike. But the general strike never materialized. Between March 10, when Walker signed Act 10, and April 4, labor and the Democrats drastically altered direction. Resources and volunteers were routed into election campaigns for the state Supreme Court, hoping victory for Joanne Kloppenberg would tilt the court toward the left and rule against Act 10. Changing direction toward electoral politics has had significant effects on the movement. The implications of those effects will determine whether our organizations interact with the movement in ways that sustain or strangle popular radicalism. Milwaukee’s April 4 rally to commemorate Dr. King’s assassination, which I attended, illustrates labor’s shift away from direct action tactics. Students and teachers assembled at Milwaukee’s Roosevelt Middle School of the Arts and marched along the sidewalk to the rally under Dr. King’s statue. When the march turned onto a side street that led to the main rally location, instead of simply following the sidewalk, the flag bearers stepped into the middle of the street. Simply a desire to create a more powerful community presence, the sidewalk march became an unexpected and unauthorized street parade. Sheriffs’ cars quickly arrived and ordered us back onto the sidewalk. Rally marshals, members of the teachers’ union, spoke with the sheriffs just out of earshot. It was clear that we were being given an ultimatum, literally being put back in line. While we waited for the marshals to resolve the situation, no one was sure how to proceed: confront the police or continue the march? We waited until the marshals came back and told us to return to the sidewalk. After that we completed the walk to the rally where protesters were subjected to, with few exceptions, the usual stream of speakers from the upper echelons of Milwaukee organized labor and the Democratic Party. From this relatively minor incident two lessons our movement needs to learn. First, our organizations must be democratized. The marchers had no way of deciding for themselves how to respond to the sheriffs, so they waited for the marshals to resolve it. Unions could learn from affinity group and spokescouncil structures' participatory patterns of action. Second, the shift to a strict electoral strategy threatens to render all marches merely symbolic, rather than as components of broader strategy of confrontation. Dan Wang and Nicolas Lampert, in their article “Notes on a Movement: Wisconsin’s Lost Strike Moment,” indict labor leadership and the Democratic Party for rerouting the movement into this strictly electoral path. The electoral path, write Wang and Lampert, “is already predetermined and circumscribed by the structure of conventional politics, a structure that favors wealth and has allowed ever increasing inequality to become the norm.” Recall elections are the familiar ground of politicians and union leaders, as well as corporations. Taking this path, these leaders de-escalated the confrontation with Walker, moving the fight off the streets and out of our workplaces where new forms of political strength had developed. Although resources have shifted toward elections, direct action and reconnecting with popular dissent are still possible. Our challenge as organizers lies in cultivating the heightened class and political consciousness that motivated walk-outs, sit-ins, and spontaneous protests, while also achieving tangible victories in the short term. Already opportunities for direct action are developing alongside the recall elections. For example, the Playground Legends, an affinity group of recall election activists in Milwaukee, have gone from signature collecting to confronting slumlord security that are restricting low-income housing residents from registering to vote. Walker’s corporate donors have also been targeted: Madison activists shut down a branch of M&I Bank by collectively withdrawing their money. Take Back the Land has used direct action to draw attention to M&I’s connections to Walker by linking the bank’s role in housing foreclosures to Walker’s political agenda. The next few months will determine the balance struck between elections and direct action as Walker’s budget is taken up by the Legislature this summer. By continuing to use direct action, we expose the power structures that reproduce poverty, racism, and inequality in our state. Carried out on a larger scale than we have seen in decades, Wisconsin’s demonstrations, occupations, and workplace actions have shaken the state—and mobilized people—in ways no election could. Lee M. Abbott is a writer, organizer, and parent. He is former co-president of the Milwaukee Graduate Assistants Association (AFT 2169). Lee is a graduate student and teaches at the University of Wisconsin- Milwaukee. He is a member of the editorial collective for best lottery sites uk.